Breakthrough Developmental Services is committed to providing excellent services with the highest professional and ethical standards. Our Human Resources Department attracts and maintains a highly qualified and diverse workforce which better serves our clients in their growth and development. Are you looking for a fantastic career with a growing company? Searching for a position with future job growth? 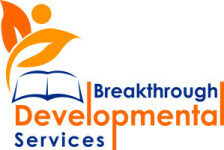 Breakthrough Developmental Services may be the place for you. We are always looking for individuals interested in providing quality services to our clients. Training is provided for all positions and persons without experience are encouraged to apply. We currently have opening in the areas listed below; however, resumes are always welcome. For all positions except the Office/Personal Assistant, use the process below to apply. To apply for the Office/Personal Assistant, click here. We are looking for staff members to work with our clients throughout DC, Maryland and Virginia. You must have a high school diploma or equivalency to apply for a position. To apply for any position, you will need to submit an application package. The full Applicant Packet should be submitted together. We cannot accept incomplete packets. A cover letter expressing interest in the position and addressing any experience that you have with people diagnosed with special needs. You should especially focus on your experiences with people diagnosed with a developmental, intellectual, or learning disability. Additionally, discuss your experience with behavior modification (ABA/VB), positive behavior support systems, or such other interventions along with information that relaying any training that you have received. Your full resume accounting for all jobs in the last 5 years. If there are any gaps in employment, explain them. Make sure you list any educational degrees and certifications. A fully completed, originally signed application. You can click here to obtain and print a copy of our current application. You will need to submit a list of professional references using the Reference Request Form. Professional references include your current or former teachers/professors, colleagues, supervisors, or employers. We will not schedule you for an interview without 3 professional references. If you have not already done so, review our entire website to become familiar with the services and methods we use. The HR FAQs page is invaluable to people who may have questions about the positions we have available and you may want to check it out first. You can find it at http://bdshelps.com/hr/hr-faqs/. Satisfactory reference, state and FBI background checks are necessary for any position.